Recently the Advanced Energy Economy Institute released a report on the Economic Impacts of Advanced Energy, demonstrating the viability of the global advanced energy market. Valued at more than $1.1 trillion worldwide, advanced energy is focused on making energy clean, affordable, and secure. While the debate on how to reduce the cost associated with implementing energy policies, increasing efficiency, and achieving environmental goals is ongoing, new advancements in energy can accelerate economic growth. 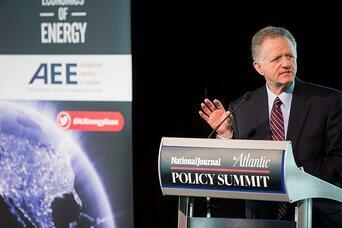 How much can advanced energy technologies contribute to our economy and energy security? Can we simultaneously meet society’s goals of economic growth, security, and promote an all of the above approach to energy sources? The National Journal and The Atlantic joined with AEE on January 24 to discuss the broad range of advancements in the energy industry and the effect they have on economic growth in America. The event featured Graham Richard, CEO of the Advanced Energy Economy, Doug Egan, Chairman and CEO of Competitive Power Ventures, Inc, and Dan Yates, Co-Founder and CEO of Opower, among other thought leaders in the advanced energy space. Watch a recording of the event below.